After Jesus’ resurrection, He appeared and spoke to His disciples and others for forty days, teaching them about the Kingdom of God (Acts 1:1-3). On the fortieth day, Jesus took His disciples out to the vicinity of Bethany, on the Mount of Olives, and while they were watching, He was taken up to heaven in a cloud. Put yourself in the disciples sandals and take a moment to think about what just happened. In the last forty days they have seen their rabbi, Jesus, who they thought would be their earthly king, arrested, crucified, resurrected, and now taken up to heaven in a cloud! The disciples have now witnessed what could be argued as the most dramatic event in all Scripture, ascending to heaven! As far as a major miracle, it would have had to be as equally impressive as the resurrection. Going to heaven to sit at the right hand of God was also a fulfillment of prophecy just like Jesus’ death and resurrection was. Yet, have you ever thought or been taught that the ascension was a major theological event? We have a day on the church calendar, forty days after Easter Sunday to commemorate the ascension, but you never hear anyone preach or teach or give the weight to this event like you do Easter and the resurrection story. In the Acts narrative in Chapter 1, we hear sermons on waiting on the Holy Spirit (Acts 1:4-8) and the commission He gave the disciples in Acts 1:8, but we don’t hear anything about the ascension itself. We celebrate Jesus’ resurrection in a big way, but His ascension is every bit as important to His deity as His resurrection. There is bound to be more here than we’ve known at first glance and has to be more to the story. The ascension is not mentioned in Matthew or John and there is only one sentence on it in Mark. From the last few verses in Luke and the first few verses of Acts, we can piece together the story – and what a story it is! Luke’s story of the gospel of Jesus Christ has quite a profound ending. Jesus gathered His disciples around Him near Bethany on the Mount of Olives. Scripture says, ”He lifted His hands and blessed them and while He was blessing them, He left them and was taken up to heaven.” When the disciples saw this, they returned to Jerusalem with great joy. It is interesting to note that Luke begins His book by telling the story of an old priest, Zechariah, who was part of the line of Aaron and the official priesthood. This old priest is unable to bless because God took his voice after he didn’t believe the angel’s story of what was about to happen to him. The end of Luke’s book is a story of Jesus, who is not a member of the priesthood and was not supposed to be able to bless. However, Jesus raises His hands and blesses His disciples. In doing this, Jesus is claiming to be the promised Messiah who would be a prophet, priest, and king all rolled into one person. By lifting His hands to bless – which only priest were allowed and commissioned to do – Jesus was claiming the priesthood and displaying His divine nature as this triune being. This was why they returned to Jerusalem with such joy! In Mark 16:19 it says that Jesus, ”was taken up to heaven and sat at the right hand of God.” This fulfills the prophetical verse in Psalm 110:1 where God declares the promised Messiah will sit at His right hand. Jesus says,”that’s me”, when He quotes that verse to the Pharisees in Matthew 22:41-45. In conclusion, because of prophecy and Jesus’ words to them, the disciples knew exactly where He was going, where He would be sitting, and what He would be doing when He got to heaven. He would now have all authority over the earth. When they saw Jesus ascend to heaven, they realized in a huge way, “Our Rabbis is King of the Universe! He’s in Charge! He does have all authority!” Then an angel comes and tells them that He will be coming back the same way that He left. 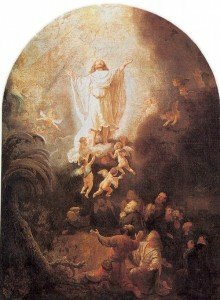 Given this background, isn’t the ascension every bit as important to God’s deity as His resurrection? The ascension proves that Jesus is the King; He is ruling and reigning over the universe now! Like the first disciples, we are also to be witnesses of His ascension. When He said to, “be my witnesses”, it was not only witness to the resurrection, it was witness to His ascension as well. We are to be witnesses that He is not only our Savior, but He is also our King! Evidently, the early disciples really believed that He was in charge of the world. Do we? By what we say and how we live, we also are witnesses to whether or not Jesus is in charge of the universe. Every time we choose to do what the King desires we are taking back a square foot of the Kingdom and are advancing the Kingdom of Heaven. Conversely, every time we choose not to do what the King desires and requires, we loose a square foot of the Kingdom. He didn’t say, “Just hang on till I get back”, He said to start advancing the Kingdom here on earth. We are to be expanding the Kingdom by the way we serve the ascended King. What square foot will you take today by living the way the ascend King wants?